Like Alex Marwood’s debut novel The Wicked Girls, The Darkest Secret has aspects of its plot readers may recognise from news coverage and public speculation about a well-known crime. In The Wicked Girls, two children are locked up for taking a toddler on a long walk and then killing her. In The Darkest Secret, a pretty blonde three-year-old disappears from a room of sleeping children who have been left unattended in a holiday villa while her parents are enjoying a meal with friends in a restaurant a short walk away. The other children don’t wake when Coco is taken, and a professional publicist leads the campaign to find her. I’ll leave you to decide if you recognise that scenario. The strength of The Darkest Secret isn’t so much the mystery of what happened to Coco – I actually guessed this at around the halfway point, including the final twist – but the chilling portrait that Alex Marwood paints of Coco’s father, Sean Jackson, and the people around him. Sean is a millionaire property developer who, his daughters later suggest, appears to have sociopathic tendencies. By the time he dies (this is no spoiler – the death is in fact the catalyst for the present-day action, which alternates with flashbacks to Coco’s 2004 disappearance) he has been married four times and is estranged from most of his children. The only constant presence in his life, and indeed after his death, is the group of equally wealthy, equally amoral friends with whom he congregates for hedonistic weekends of excess – among them an ambitious Tory MP, a celebrity publicist and a doctor to the stars known for his ‘treatment’ of rock stars on tour. What begins as a series of sharp, satirical observations of a spoilt, shallow, self-serving gang of ageing rich kids gradually becomes something much more sinister, almost grotesque. There are several moments where their behaviour is so shocking that it teeters on the brink of unsettling heightened reality, but in a way that's appropriately nightmarish rather than the stuff of caricature. Fortunately, there are sympathetic characters - spending so much time in the company of Sean and his repulsive friends would be almost unbearable without any counterpoint at all. Half the story is narrated by Camilla, Sean's daughter from his first marriage, who with her trust fund and her faux-boho Camden lifestyle could easily have been utterly dislikeable, but instead develops into an astute, protective older sister to Coco's twin Ruby and - obsessed as she is with personality disorders - a perceptive narrator with a surprisingly clear moral compass. The relationship between Camilla and Ruby is touching and convincing, and their respective observations about their father and his marriages are often terribly sad. Amid the darkness and the tension (of which there's plenty; this was very much a book I wanted to stay up late to finish) there's a real pathos to some elements of this book. Without giving too much away, The Darkest Secret is not a neatly-resolved crime thriller - there were a couple of hints I expected to be picked up upon which were ignored at the end, and doubtless some readers will finish this book frustrated at the position in which certain characters are left. Personally, I feel that Alex Marwood took some brave choices with the way this novel ends, and was right to do so. 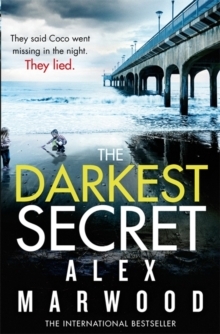 My thanks to the publisher, who gave me a copy of The Darkest Secret via NetGalley in exchange for an honest review.